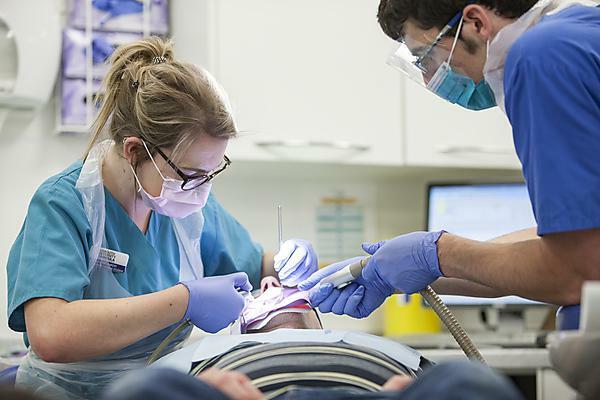 A new paper published in the British Dental Journal highlights how dental hygiene therapists can be successfully trained alongside dentists, thanks to a pioneering model of teaching at the University of Plymouth. Developed by a team of academics from Peninsula Dental School, Plymouth’s Dental Hygiene Therapy (BDHT) programme, which commenced in 2014, is the first of its kind to be integrated with the Dental Surgery (BDS) programme. BDHT and BDS students are taught together (inter-professional education) throughout the course structure. Led by Clare McIlwaine, Lecturer in Oral Health Sciences in Peninsula Dental School, the paper highlights the BDHT curriculum and the novelty of the programme. The full paper is entitled A novel, integrated curriculum for dental hygiene therapists and dentists and is available to view now doi: 10.1038/sj.bdj.2019.11. Since its inception, the integrated programme has received an award of General Dental Council sufficiency, 100% BDHT graduate employment and 100% final-year pass rate. The paper also highlights the need for better understanding of dental hygiene-therapist roles and their importance in shared care. How do we train and sustain tomorrow's healthcare workforce? McIlwaine, Dr Daniel Zahra and Dr Louise Belfield are showcasing the integrated teaching model at the University of Plymouth Research Festival 2019 on 24 January. “To meet the challenges of an ageing population with increasingly complex treatment needs, clinicians are expected to provide patient-centred care in a collaborative, interdisciplinary team environment, and that has seen dental hygiene-therapists take on a broader range of treatments. "However, there may be still misconceptions within both professions about what the other does. In order to tackle these issues in practice, they must be tackled at the earliest stage of their careers – undergraduate – and that’s one of the reasons we developed the programmes as we have. The University’s primary care teaching model is also pioneering in the UK – and designed for students to obtain hands-on experience with the patient groups they are most likely to encounter once qualified.